Dawlance has signed a memorandum of understanding with MCB Bank Ltd, which will allow the Bank’s credit card consumers to avail all high-end Dawlance products at zero mark-up on 12-month and 18-month installments plans respectively. The promotion is applicable on selected Dawlance refrigerators, washing machines, deep freezers, split air conditioners and microwave ovens. “The rapid burgeoning e-commerce industry of Pakistan has made life more convenient for people here”, he added saying that the zero mark-up offered by MCB Bank Ltd on different installment plans will significantly benefit end consumers. 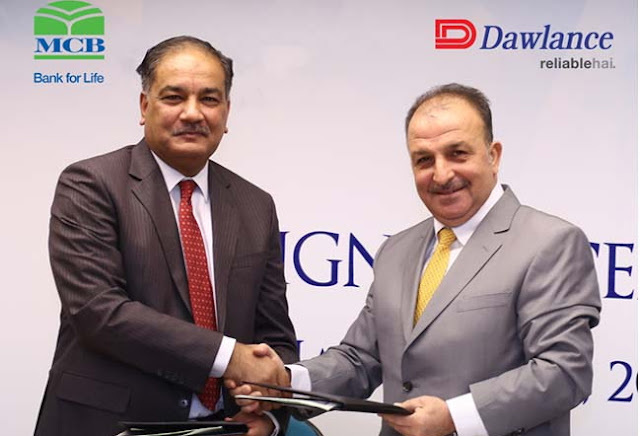 Speaking on the occasion, Nadeem Afzal – Group Head Consumer Banking from MCB Bank Ltd said that the partnership would assist in enhancing the accessibility of the Bank’s financial services and would be equally beneficial for its consumer base, which will be able to purchase Dawlance’s quality home appliances at discounted prices. By virtue of this MoU, MCB Bank Ltd intends to facilitate its customers as well as to boost its financial services. It’s credit card customers will be able to purchase quality home appliances from Dawlance at special discounted prices.